Cotton Canvas Multi-Cord Lounge Hammock Just $27.99 Down From $69.99 At GearXS! Ships FREE! You are here: Home / Great Deals / Cotton Canvas Multi-Cord Lounge Hammock Just $27.99 Down From $69.99 At GearXS! Ships FREE! GearXS has this Cotton Canvas Multi-Cord Lounge Hammock on sale for $27.99 (Reg. $69.99) + FREE shipping! Relax in style, while soaking up the sunshine in blissful luxury. 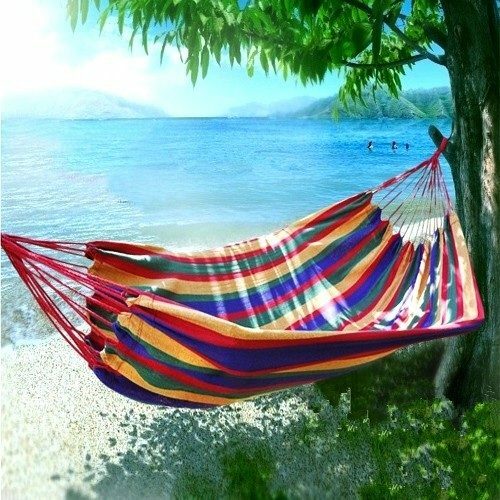 This hammock is perfect for garden and backyard lounging, as well as camping, traveling and backpacking. It’s constructed from durable, comfortable cotton canvas in a multi-colored striped design with multi-cord loop suspension. Supports up to 350 pounds. Includes carrying and storage bag. Measures approximately 78″ x 63″. Order yours today while supplies last.